India’s ruling coalition – the National Democratic Alliance (NDA) – has halted plans for establishing a SAARC Development Bank, Indian media reports. Although the previous government’s proposal to establish the bank was endorsed by the 18th SAARC Summit in November, an Indian external affairs official was quoted as saying that feasibility studies had suggested it was an inappropriate time to establish the bank. “We studied the contributions that can be made by other multilateral institutions, funding that can be sourced through external commercial borrowing route, but the shortfall after that is still huge. Ultimately, that shortfall has to be borne by India. So we decided to explore alternatives available,” said the unnamed official. Meanwhile Indian Prime Minister Narendra Modi is reported to have submitted an “alternative proposal”, which his government is now working on. Modi has been a strong advocate of greater regional integration since assuming office, being seen as the driving force behind the resumption of the SAARC summit after a three-year hiatus. 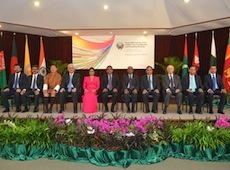 The South Asian Association for Regional Cooperation comprises of Afghanistan, Bangladesh, Bhutan, India, the Maldives, Nepal, Pakistan, and Sri Lanka. India’s Ministry of Civil Aviation will provide leave travel concessions (LTC) for state employees travelling to the Maldives, Sri Lanka, Bhutan, and Nepal in an effort to boost regional tourism among SAARC member nations, reports The Financial Express. State employees will require approval from the ministry in order to utilise the LTC on Air India when flying to the selected countries. Senior government officials were reported as saying the move is expected to enhance tourism, and subsequently economic development, in the South Asian region. “There are around two million government employees. With the extension of the LTC scheme there is bound to be greater tourist inflow and outflow with these countries,” an Indian government official is quoted as saying. Air India currently operates 14 flights to the Maldives per week – between Malé, Trivandrum, and Bangalore – although Indian tourists make up less than four percent of the million-plus visitors to the Indian Ocean archipelago each year. During the 18th SAARC Summit held in Nepal last November Indian Prime Minister Narendra Modi stressed the need for increased regional connectivity noting that “it is still harder to travel within our region than to Bangkok or Singapore, and more expensive to speak to each other”. The conclusion of the summit saw the signing of the Kathmandu Declaration which called ‘Deeper Integration for Peace and Prosperity’. The 18th SAARC summit has concluded, with President Abdulla Yameen adding his signature to the Kathmandu Declaration. A new regional Framework Agreement on Energy Cooperation was also signed by all members of the association, aiming to facilitate cross-border trade of electricity on a voluntary basis. The summit declaration was themed ‘Deeper Integration for Peace and Prosperity’ and focused on institutional reform of SAARC as well as the vulnerability of Small Island Developing States. At the start of the summit earlier this week, President Yameen had called upon the association to make its voice heard in the international community, as well as criticising the group’s complacency on the subject of climate change. “Importantly, the Declaration underscores the importance of the international community to conclude a legally binding outcome in the fight against climate change before the end of 2015,” read a foreign ministry statement accompanying the summit’s conclusion. The declaration pledged commitment to a phased-in South Asian Economic Union via a free trade area, customs union, common markets, and economic and monetary union. The Maldives has recently been elected chair of the Alliance of Small Island States – the 44-member lobby group for such countries within the UN system, which focuses primarily on the effects of climate change. The Kathmandu Declaration also urged relevant bodies to identify projects in the area of power generation to meet growing regional as well as “taking into account the existential threats posed by climate change to some SAARC Member States”. The Maldives government is currently aiming to generate 30 percent of its power from renewable sources within five years. Local media yesterday reported that India had offered to assist the Maldives in its search for oil. All leaders also “reiterated their strong commitment to ensure good governance for sustainable development by promoting accountability, transparency, the rule of law and people’s participation at all levels of governance,” read the declaration. The summit is the first such meeting since the Maldives’ summit in 2011, having been organised after recently elected Indian Prime Minister Narendra Modi invited his regional counterparts to his inauguration in May. President Yameen was able to meet separately with Modi, Pakistani Prime Minister Nawaz Sharif, and Sri Lankan President Mahinda Rajapaksa during the summit before returning to the Maldives today. Minister of Foreign Affairs Dunya Maumoon signed the energy agreement on behalf of the Maldives, committing to enable energy traders to negotiate the terms of exchange, and to share technical knowledge with a view to opening up the electricity sector. Leaders also promised to sign further agreements on passenger and cargo traffic within three months, after Pakistan were reported to have declined signing the agreements until further internal discussions. Observers of the 18th summit included Australia, China, Iran, Japan, South Korea, Mauritius, Myanmar, the USA, and the EU. Suggestions that the status of China be upgraded were rebuffed by Indian officials earlier this week, who suggested that greater integration between current states should be remain a priority. Pakistan has offered to hold the next summit, mandated by the SAARC Charter to held at least once a year. “The South Asian Association of Regional Cooperation (SAARC) is not a shining model of regional cooperation,” writes Shastri Ramachandran for the Eurasia Review. “It is seen as a talking shop – of a region that accounts for the largest population of the poor – with lofty goals, high-sounding resolutions, ringing declarations and little by way of achievement. The Maldives’ judiciary continued to dominate headlines this week, in particular the Supreme Court’s decision to use privileged Majlis testimony in its case against the Elections Commission. Citing the establishment of justice as a fundamental tenet of Islam, the court declared the evidence admissible in its ongoing contempt of court case. Speaking at a campaign event for the Majlis elections, Maldivian Democratic Party (MDP) leader Mohamed Nasheed suggested the Supreme Court was fearful of an MDP majority in the parliament, pledging judicial reform should this happen. On the lower benches, televised claims of bribery within the judiciary by Civil Court Judge Aisha Shujoon prompted both the Anti Corruption and the Judicial Services Commissions to launch separate investigations. The JSC’s investigations into Shujoon’s claims will take place without the Majlis’ representative MP Ahmed Hamza, however, who has been removed as a result of his standing for re-election. The Human Rights Commission this week called upon the Majlis to expedite the appointment of a new Prosecutor General (PG), before the Criminal Court finally agreed to accept new cases from the Deputy PG. The court was immediately presented with 20 new cases, although the PG’s Office has said the backlog will take a month to clear. This may hamper new court regulations which requires the office to file criminal charges within 45 days of arrests being made. The court did find time this week to sentence MDP MP Abdulla Jabir to one year’s imprisonment for failure to provide a urine sample to police in late 2012. Three more cases are likely to land on the PG’s desk in the next six weeks after police arrested two Bangladeshi men and one woman in Malé for pre-marital sexual relations. For those recently married foreigners, however, the Maldives continues to be the number one holiday destination, an online poll revealed. Fears were raised by the Tourism Employees Association that the amount of service charge disbursed to resort workers was being reduced as the government plans to raise taxes on the industry. An IMF delegation in the country noted its surprise at the resilience of the economy, suggesting that taxes on the industry were still relatively low. The new nominee for the governor’s position at the central banking authority suggested that increasing local productivity and reducing reliance on imports – on which 75 percent of the country’s dollars are spent – was vital. During the SAARC Council of Ministers’ Meeting – hosted on Bandos resort – President Abdulla Yameen stated his belief that trade and commerce were the “magic wand” for achieving the regional association’s goals. Earlier in the week, while campaigning for the Progressive Party of Maldives, Yameen had labelled the Nasheed government’s transport policy corrupt, vowing to reclaim land given to private companies for ferry services. He also said that the government would not be seeking to expedite Nasheed’s trial, though he did suggest that the former president must be sentenced for the arrest of Judge Abdulla Mohamed in 2012 if the rule of law is to be upheld. The police’s campaign to reach out to the nation’s youth continued this week with the third ‘Blues for Youth’ camp. Home Minister Umar Naseer told participants that there was “no task too menial or lowly for a Maldivian”. Meanwhile, Naseer signed an order shutting down Malé’s Dharumavantha Rasgefaanu mosque after an unauthorised congregation had prayed for the government’s destruction. As Yameen’s administration approaches the one hundred days’ milestone intact, the policy to provide greater access to healthcare was introduced in Villinigili – albeit on a more modest scale than initially promised. In nearby Gulhi island, a pioneering desalination project was launched by the UK’s Aquiva Foundation. The project – a joint venture with STELCO – will produce drinking water using the excess heat from electricity generators. Further north, Alifushi island council has complained that emergency drinking water supplied to the island arrived contaminated with dust and bacteria. Finally, the Olympic Committee this week announced plans to increase female participation in sports, setting a target of 33 percent of contingents sent to major international games to be women. Trade and commerce is the “magic wand” for achieving the South Asian Association for Regional Cooperation’s (SAARC) goals of mutually beneficial cooperation, President Abdulla Yameen suggested this morning at the inauguration of the 35th session of the SAARC council of ministers. In his speech at the council of foreign ministers hosted by the Maldives at Bandos Island Resort, President Yameen said that poverty, malnourishment, gender inequities, and access to safe drinking water and food were among some of the “collective challenges” faced by South Asian countries. “If there is a magic wand to enable SAARC to achieve these goals, it is trade and commerce. Commerce unlocks the doors to each other’s countries, and cultivates closer ties of mutual understanding. Business transactions foster good neighbourly relations through the sharing of goods and values,” Yameen said. Yameen observed that the volume of trade within the region “remains at an abysmal low”. “It is sad but true that SAARC member states often import from third countries goods produced in other SAARC countries. Barriers to entry and transaction costs are high,” he explained. While the South Asian Free Trade Agreement (SAFTA) was drawn up as “a grand scheme” to enhance regional trade, Yameen argued that SAFTA has in many cases created “even more barriers”. In the 27 months since the Maldives assumed chairmanship of SAARC, Yameen noted that progress has been made in “key areas of cooperation” such as trade, commerce and finance. Despite being home to one-quarter of the world’s population, Yameen observed that the regional bloc held “limited power” in the international arena. “We command limited attention and we demand limited engagement. Despite our share of the global population, we carry no collective voice,” he said. South Asian countries should “stand up for each other, protect each other, and fight the cause for each other,” he said, calling on member states to “show the world the solidarity of SAARC”. “It is time that the member states of SAARC forge common positions on critical issues of importance to our region and the rest of the world. Individually, we might only have limited impact or little strength, but collectively we can move mountains,” he said. He added that the Maldives, despite being the smallest state in the association, had “a disproportionate stake in ensuring ensuring that regional cooperation succeeds in South Asia”. On the need for reforms, recognised since 1997, Yameen noted that member states agreed during the summit held in Addu City in November 2011 to conduct “a comprehensive review of SAARC processes and institutions”. The SAARC secretariat conducted a study to “streamline, rationalise, restructure, and strengthen SAARC mechanisms and processes,” which was being deliberated by foreign secretaries in order to implement its recommendations. As the current meeting of foreign ministers was the last before Secretary General Ahmed Saleem – former chair of the Human Rights Commission of Maldives – hands over the rotating post to Nepal, Yameen expressed “deep appreciation for his major contribution to strengthen the association through his dedication and astuteness”. Following consideration of the secretariat’s study, President Yameen said the Maldives would stress further cooperation in identified areas, using SAARC for building regional resilience, and “increasing the association’s international relevance”. Concluding his address, President Yameen called on member states to “give meaning to the lofty goals set out in the charter” and “return to its original idea of promoting the quality of life of the peoples of South Asia”. “Because, it certainly is the time for SAARC to help the peoples of our region in their march towards their manifest destiny,” he said. Among the issues on the agenda for the council of foreign ministers today – the highest level meeting since November 2011 – were strengthening relations with observers, reviewing the secretariat’s study, and enhancing regional connectivity. A decision on the inclusion of Turkey as a SAARC observer state is also up for discussion. At its meeting during the November 2011 summit, the council agreed to conduct feasibility studies for an ‘Indian Ocean Cargo and Passenger Ferry Service’. The 17th summit concluded with the signing of the ‘Addu Declaration,’ which contained key agreements affecting the region, including a commitment to establish the passenger and cargo ferry service. Other agreements included the strengthening of the SAARC Secretariat, the establishment of a South Asian Postal Union, and intensification of efforts to reduce non-tariff barriers to trade and reduce the sensitive lists, which include items excluded from tariff concessions. Indian Minister of External Affairs Salman Khurshid has arrived for a three day visit to the Maldives after being delayed due to domestic commitments. During his visit, Khurshid will attend the SAARC Council of Ministers meeting on Bandos Island Resort. As well as calling on President Abdulla Yameen, the minister will hand over landing craft to the MNDF, and will take part in a ceremony handing over the India-Maldives Friendship Faculty for Hospitality and Tourism Studies to the Maldivian government. Khurshid will also lay the foundation stone of a new building to be used by the Ministry of Defence and the Coast Guard. The visit External Affair’s Minister Salman Khurshid to the Maldives has been postponed, with Indian media reporting that that the minister’s presence was required in parliament for the passage of the contentious Telangana bill. The bill, which divides the state of Andhra Pradesh – creating Telangana, the country’s 29th state – was passed yesterday amidst fractious scenes in the Lok Sabha. Khurshid’s visit to the Maldives was due to begin today (February 19), with the trip said to include that handing over of naval craft and a new tourism training facility to the Maldivian Government. These events have now been delayed. Foreign Secretary Sujatha Singh is reported to have already travelled to the Maldives to participate in tomorrow’s SAARC foreign ministers’ meeting. Speaker of India’s Lok Sabha Meira Kumar has called on SAARC parliaments to support the work of their election commissions, stating that it is the vote that enables the poorest and weakest to decide the destiny of their nations. “It is crucial that the voters are able to elect their representatives freely, without any fear or favour. Hence the institution of Election Commission must be bolstered,” she said. Speaking at the 7th conference of the Association of SAARC Speakers and Parliamentarians (ASSP) held at Bandos Island Resort yesterday, Kumar said she took pride in the Indian Election Commission’s sterling reputation. Discussing the theme ‘Strengthening democracy through institution building’, Kumar shared India’s democratic experience, highlighting especially the role of an impartial judiciary. Parliamentarians must strive to guarantee access to judicial remedies for each and everyone, she said. Anti-corruption legislation and right to information bills are crucial in ensuring transparency and certainty of executive action, she continued. “In India, the Right to Information Act has augmented the accountability of public authorities by putting their functioning into the public domain. The issue of corruption in governance is being widely discussed across the entire SAARC region and we have to find ways to eradicate it,” she said. She also identified inclusive political parties, local governments and media as key institutions that require parliamentary support. Political parties need to sponsor more women in public life, she said, noting that although South Asian women constitute 23 percent of the world’s population they are not adequately represented in the political arena. Mechanisms such as reservations for women must be set in place to ensure their equal participation, she said. Decentralisation is the key to strengthening democracy as it “stimulates public participation,” she stressed. The devolution of power in India through the 73rd and 74th constitutional amendments brought three million elected representatives, including about 1.2 million women to the center stage. Further, parliaments represent the sovereign will of the people, and as such they must not only legislate, but also mold opinions to trigger social transformations, she said. “We must understand that Parliaments can frame any number of progressive legislations but unless the people believe in the necessity of these laws, they will remain confined to the rule books,” she said. Describing democracy as a journey, Kumar said India is still evolving and devising new ways to meet emerging challenges. Parliamentarians can take the lead in reinforcing democracy through institutional development, she reiterated. The three day conference on SAARC parliament’s roles in institutional building and inclusive development ended today. The ASSP was established in 1992, with the aim of exchanging ideas and information on parliamentary procedures and information among parliaments, and to strengthen South Asia as a stable and independent region. Maldives Speaker Abdulla Shahid said the organization had decided to amend its charter to include a women’s committee of parliamentarians as a charter body as well as form a forum for young parliamentarians (age 18- 40).